Teamwork, mobile units, and flexibility restored imaging services to NYU Langone in just under two months. “Crisis always gives you opportunity,” according to Michael P. Recht, MD. The crisis named Hurricane Sandy that swamped NYU Langone Medical Center last October gave Recht, the hospital’s radiology chair, and his colleagues an opportunity large enough to drive a truck through. So that’s exactly what they did, to start—with an MRI unit in the trailer. When the hurricane’s storm surge hit New York on Monday, October 29, 2012, the nearby East River flooded Lower Manhattan’s streets, tunnels, subways, and basements—including the medical center’s. Langone’s basement imaging department housed MRI and CT scanners along with X-ray rooms. Without power and with ruined equipment, no one knew when the hospital would return to serving the city. Before NYU Langone could reopen for inpatient and surgical care—less than two months after rain and flooding caused nearly $1 billion damage to its clinical, research, and academic facilities—imaging services had to be restored. And that circles back to driving a tractor trailer through the hospital lobby. When the storm had passed and hospital staff began putting NYU Langone’s imaging department back together again, Recht—and everyone else involved with the medical center—faced numerous challenges. Space is a major issue in New York City. In many places, trailers and temporary structures can be placed next to a building on a spacious hospital campus. That’s rarely possible in Lower Manhattan, where there is usually another building adjacent to each building. In addition to CT, MRI, and X-ray, Langone lost its ultrasound capability in the storm, but getting that up and running was comparatively easy. Siting requirements are minimal, and an ultrasound unit can be rolled onto an elevator and taken nearly anywhere it’s needed. So it took only two weeks to restore outpatient ultrasound services in a Langone building four blocks away from the main hospital, according to Recht. Reading rooms were set up in undamaged spaces within a week of the storm. For other imaging equipment, the job proved more complicated and larger—in some cases, tons larger. X-ray and CT rooms require shielding and a 64-slice CT scanner can weigh 3,000 to 4,000 lbs. CT scanners involve more siting issues than ultrasound, but a CT scanner at least still can fit into a fairly standard 6,000-lb-capacity freight elevator. When the discussion turns to MRI magnets, however, the weight and the game change significantly. Manufacturers and resellers report that a magnet weighs 6,400 to 8,900 lbs (3.2 to 4.45 tons) for a 1.5T system. 3T systems with much heavier magnets can exceed 26,000 lbs (13 tons), more than double the typical limit on heavy-duty freight elevators. The realities of real estate space, weight, not wanting to put MRI equipment in the recently flooded basement, and the desire to create a temporary imaging department that could function as normally as possible until the new permanent facility could be constructed is what brought Vartanian’s trailer onto the Langone scene and through its 9-ft-wide doors. “We’re a mobile imaging company, so we have mobile MRIs, CT scanners, and cardio cath labs. 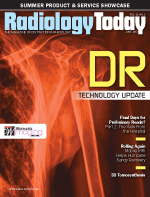 When there is a disaster, hospitals may lose their ability to do imaging for their patients,” so Medical Imaging Resources is one avenue to help, Vartanian says. Vartanian turned to client Chelsea Community Hospital outside Ann Arbor, Michigan. The hospital, which was in the late stages of its own renovations, agreed to lend a mobile MRI unit to NYU Langone to help it restore its imaging facilities. Medical Imaging Resources hauled the unit from Michigan to New York. After a 15-hour trip, Vartanian and his colleagues worked until 4 am to install the unit. But NYU Langone didn’t want to just park a trailer next to its building, even if that meant putting it in an internal courtyard. When the hospital did reopen, the unit would provide inpatient imaging services to patients who tend to be sicker than those who would use outpatient services normally provided by a mobile unit. The ability to conveniently move patients from their rooms to the MR suite was a high priority. Recht says one key objective of the temporary imaging center was to make patients feel as if they were in a permanent facility. He says contractors worked nearly round the clock, including weekends, to build connecting hallways, including windows, from the hospital to the trailer in the courtyard. Patients transported from the reopened hospital could be rolled right into the MRI suite. “From the patient’s perspective, you cannot tell you are going in and out of the building,” he notes. Ultimately, one wall of the trailer was removed to allow better access and space for anesthesia services needed for some exams and to improve workflow in the trailer. In less than two months, the imaging facility was ready to accept inpatients when the hospital reopened on December 27, 2012. The crisis at NYU Langone following Hurricane Sandy brought out the best in nearly everyone associated with getting the facility up and scanning after the storm. Recht praises the architects, hospital staff, and contractors for working together to make such a complex job happen so quickly. He says one especially rewarding part of the rebuilding project was how pitching in meant embracing needed change, which doesn’t always happen in organizations. “People were open to change and doing what needed to be done, not looking for an excuse not to do something,” Teahan says. He adds that maintaining that attitude after the crisis will prove extremely valuable as the medical center moves forward. “It’s an education that even when the situation improves, people keep looking for ways to improve,” Teahan says. While the medical center is back in business, Recht points out that recovery continues at NYU Langone. Ongoing construction plans call for two new permanent inpatient MRI magnets and suites to be completed by the end of 2013. He says finishing the outpatient imaging facilities in a new MRI center will take longer, perhaps another year. Most mobile imaging companies house their units in 8-ft-wide trailers. Using standard width for over-the-road tractor trailers makes sense for truly temporary mobile units that may operate for only a few days or weeks before heading off to the next worksite. A standard trailer can travel most roads without the need to follow wide-load shipping regulations. While such quarters may be a little tight, portability is the point of the most mobile imaging units. But some temporary jobs are less temporary than others. For a hospital planning a major renovation, the imaging department could be out of commission for many months. If the facility can’t create interim imaging facilities in existing spaces, a more permanent temporary arrangement could make good sense. Medical Imaging Resources offers that portable permanence in the form of 10-ft-wide trailers that can fill the need between a standard mobile unit and temporary imaging facilities built in modular buildings. John Vartanian, president of Medical Imaging Resources, makes the analogy comparing a modular home with an RV. The RV will prove more beneficial if the primary objective is having a movable home for travel. However, if more comforts of home on a temporary basis are desired, a modular home could be a better option or, in this case, the larger imaging trailer. • body frame seismic tie-downs.